Support Dynamics 365, Premise, Live, Hosted deployments. Support Dynamics CRM 2016, 2015, 2013, 2011, 4.0 and 3.0 systems. The COZYROC SSIS+ library also includes the powerful and elegant Data Flow Task Plus, not found in any other competitive product on the market. Data Flow Task Plus allows creation of dynamic data flows at runtime and can be used with COZYROC's Dynamics CRM adapters. By using this task, the mapping of columns from the source to the destination is done dynamically at runtime. This means you can create a single process to migrate the data from every Dynamics CRM entity from on-premise to on-the-cloud. In addition, you can create integration processes where the addition or deletion of Dynamics CRM entity attributes doesn't necessitate modification of existing SSIS packages. This powerful feature requires no programming skills to use and greatly simplifies your maintenance efforts. In this section we will show you how to set up a Dynamics CRM Source component. 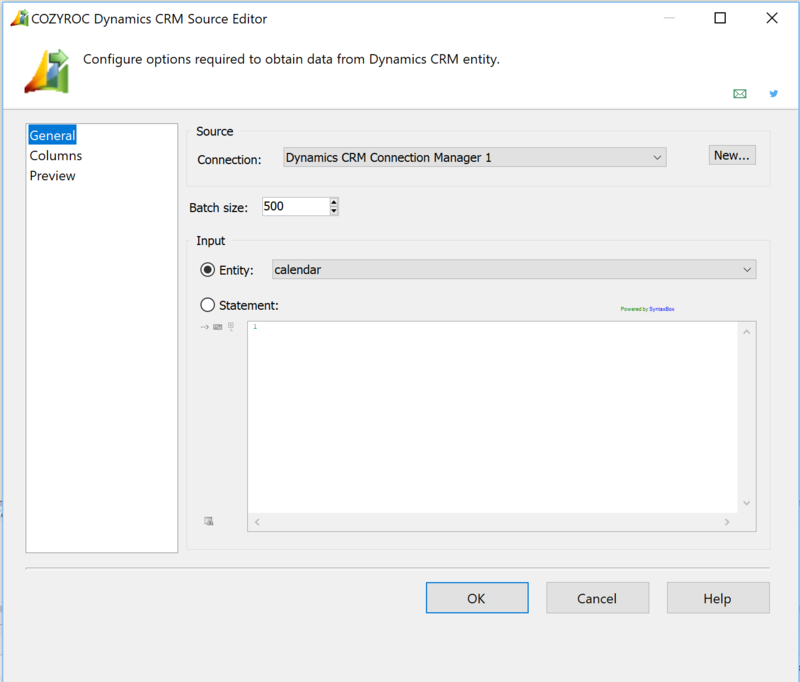 Before you begin, configure a Dynamics CRM connection manager. Drag the Data Flow Task from the SSIS Toolbox to the Control Flow canvas. Click the Data Flow tab to go to the Data Flow canvas. In the SSIS Toolbox, locate the Dynamics CRM Source component and drag it onto the Data Flow canvas. Double-click on the component on the canvas. Once the component editor opens, select the connection manager you configured earlier from the Connection drop-down list. For Input, either select Entity or Statement. If you selected Entity, then select the entity you want to work with from the drop-down list. If you selected Statement, then compose a FetchXML statement to retrieve the entity and records you want from the source. Click OK to close the component editor. Congratulations! You have successfully configured the Dynamics CRM Source component. In this section we will show you how to set up a Dynamics CRM Destination component. Configure a source component that will provide the data to be written to Dynamics CRM. Ensure that you are on the Data Flow canvas. In the SSIS Toolbox, locate the Dynamics CRM Destination component and drag it onto the Data Flow canvas. Connect the blue arrow from the source component or the data flow transformation that you want to immediately precede the Dynamics CRM Destination component. Choose the desired Action (Create, Update, Delete, or Upsert). Choose the Entity you will be working with. The options will vary depending on the Action you selected. Check the options you desire. Descriptions of the options can be found in the Parameters section of the Dynamics CRM Destination documentation. Congratulations! You have successfully configured the Dynamics CRM Destination component. In this section we will show you how to set up a Dynamics CRM Connection Manager to access an on-premise installation of Dynamics CRM. The same method can be used to set up a connection manager for Dynamics CRM in the cloud. Scroll down to find Dynamics CRM and select it. Once the connection manager dialog opens, select your Edition from the drop-down list (CRM 2011+, CRM 4.0 or CRM 3.0). Select your type of Deployment from the drop-down list (Premise, Live, or Hosted). Enter the URL or IP address for the Server. Congratulations! You have successfully configured a Dynamics CRM connection manager. 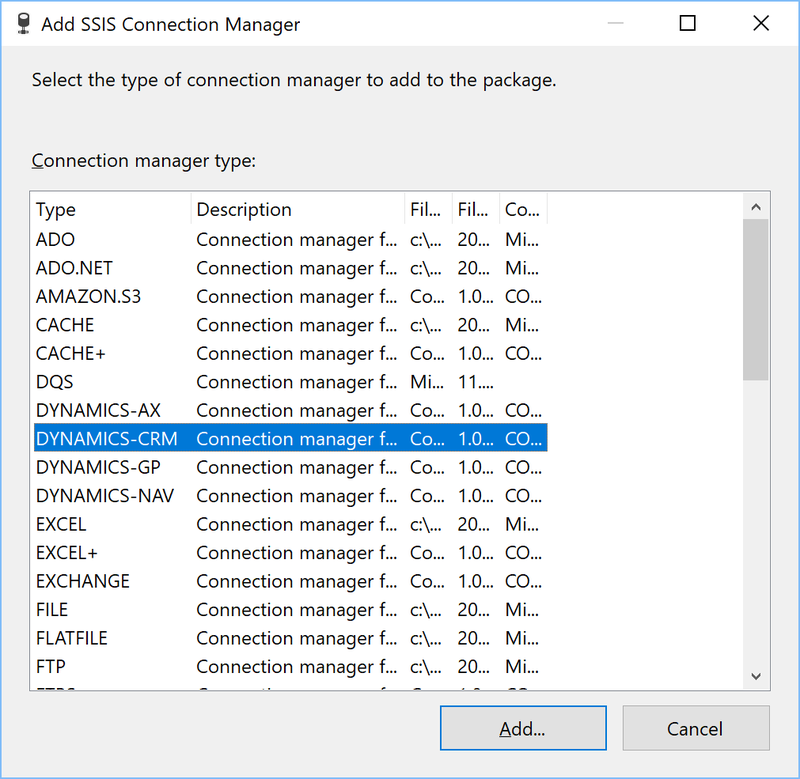 Dynamics CRM Connection Manager is SSIS Connection Manager for establishing connection to an on premise or in-the-cloud Dynamics CRM server. Use the Server page of the Dynamics CRM Connection Manager dialog to specify properties for connecting to Dynamics CRM service. Specify edition. This property has the options listed in the following table. CRM 2011 Connect to CRM 2011 and above web services. Requires .NET 3.0 and up. CRM 4.0 Connect to CRM 4.0 web services. CRM 3.0 Connect to Dynamics CRM 3.0. Specify deployment type. This property has the options listed in the following table for CRM 2011 edition. Office 365 Connect to Office 365 deployed Dynamics CRM. Premise Connect to on premise Dynamics CRM. Live Connect to Dynamics CRM Live service. This property has the options listed in the following table for CRM 4.0 edition. Premise Connect to on-premise Dynamics CRM server. Hosted Connect to hosted Dynamics CRM. Specify the name or IP address of the Dynamics CRM service. Microsoft-hosted Dynamics CRM uses different address for different regions. The addresses for each region and web service type are listed in the following tables. Specify user name to access Dynamics CRM. Specify password to access Dynamics CRM. Specify caller identifier for user impersonation. Use the Proxy page of the Dynamics CRM Connection Manager dialog to specify properties if your server is behind firewall. Where can I find the documentation for the Dynamics CRM Connection? When Dynamics CRM is setup in IFD (Internet Facing Deployment) authentication mode I get error: "The request failed with HTTP status 401: Unauthorized. (System.Web.Services)". When Dynamics CRM is setup with Ping Identity authentication system I get error: "An error occurred when verifying security for the message". How to trace the web services calls in use. New: Support for Multi-Select Picklist attributes. New: Setup a more appropriate DT_DBDATE column data type for attributes with DateTimeFormat.DateOnly setting. New: Setup includes the unique name of the selected organization. New: Access Control Service (ACS) is no longer used to connect to Dynamics 365/CRM Online. Fixed: Type attributes for Customer fields were not handled correctly (Thank you, Siraj). Fixed: Failed with error "http://:80 end point not found" when trying to connect to Dynamics CRM 2015 Update 1 and above. Fixed: Failed with error "ID3242: The security token could not be authenticated or authorized." when processing for more than 8 hours (Thank you, Tamanna). Fixed: Failed with error "Security Support Provider Interface (SSPI) authentication failed." when trying to connect to CRM 2011 on premise server using Windows authentication. New: A new CallerId parameter for setting user impersonation. New: Support for CRM 2011 web services ActiveDirectory authentication. New: Support for Office 365 deployed systems with Federated (delegated) security. New: Support for CRM 2011 web services. Fixed: Not able to connect to hosted CRM service (Thank you, Joao). New: Support for CRM Live deployment in EMEA and Asia. This SSIS Data Flow Component retrieves data from the Dynamics CRM service. The Input type can be either an entity or a FetchXml statement. The configuration parameters are provided in the standard data flow source component dialog. 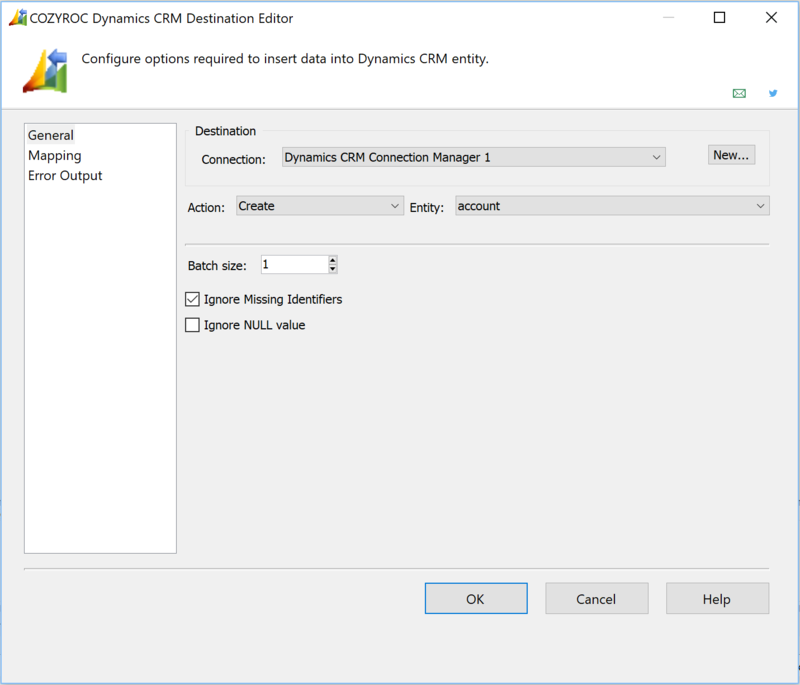 Select an existing Dynamics CRM connection manager. Specify the number of rows to be retrieved as a batch. The maximum is 500. Specify the input type. This parameter has the options listed in the following table. Entity The input type is a Dynamics CRM entity. Selecting this value displays the dynamic parameter Entity. FetchXML The input type is a FetchXML query. Selecting this value displays the dynamic parameter FetchXML. After changing the input type, you must use the Refresh command in the 'Column Mappings' tab to reload the source entity metadata. Select the Dynamics CRM data entity. Specify the FetchXML statement. Select to design your query in the standard Advanced Find dialog. Where can I find the documentation for the Dynamics CRM Source? When I try to select entity in Dynamics CRM Source component I get error: "No connection could be made because the target machine actively refused it". Dynamics CRM Connection Manager 'Test Connection' command works fine. Data flow transformation, performing lookup against Dynamics CRM service. Data flow source to retrieve Dynamics CRM entity attributes metadata. Data flow source to retrieve Dynamics CRM entity metadata. Data flow transformation to retrieve Dynamics CRM audit log records. Make sure that the audit logs feature is enabled for that entity. Fixed: Component returned date-only attributes incorrectly in UTC (Thank you, Maurizio). Fixed: Component failed with error "The top attribute can't be specified with paging attribute page" when FetchXML top element was used (Thank you, Cosmin). Fixed: Component incorrectly converted input UTC datetime columns to local time. This broke backwards compatibility for existing packages (Thank you, Saritha). Fixed: Component didn't handle type attributes for Customer fields correctly (Thank you, Siraj). Fixed: Component failed when specified FetchXml statement contained apostrophe (') symbol (Thank you, Andrew). Fixed: Component created duplicate column names when using FetchXml statement containing link-entity element with reference to the same entity with two different aliases (Thank you, Andrew). Fixed: Component failed with error "An error occurred while parsing EntityName..." when input data contained invalid activity party email address (Thank you, Nicholas). Fixed: Component failed to read BooleanManagedProperty attributes (Thank you, John). Fixed: Component was inefficient when retrieving from activities in system with millions of activity party records (Thank you, Allen). Fixed: Component did not handle aliased values in CRM 2011 (Thank you, Yatik). Fixed: Component now handles better FetchXML statements containing linked entities. Fixed: Failed when certain FetchXML statements were specified (Thank you, Jamal). New: Component can now retrieve data from StringMap and ListMember entities. New: Component now provide better error diagnostic information. Fixed: Fixes to support Dynamics CRM 2011. This SSIS Data Flow Component loads data into the Dynamics CRM service. The configuration parameters are provided in the standard data flow destination component dialog. Select a destination entity action. This parameter has the options listed in the following table. Create Create new records in the destination entity. Update Update existing records in the destination entity. You must specify the appropriate entity record identifier (the GUID assigned by Dynamics CRM) for the update to work. Delete Delete an existing record from the destination entity. You must specify the appropriate entity record identifier (the GUID assigned by Dynamics CRM) for the delete to work. Upsert 1.6 Update existing records and insert new records in the destination entity. Selecting this action displays the dynamic parameter UpsertMatch. After changing the action, you must use the Refresh button in the 'Component Properties' or 'Column Mappings' tab to reload the destination entity metadata. Indicate the destination Dynamics CRM entity where the data is to be loaded. Specify how unrecognized identifiers are to be handled. When this parameter is set to True, the component will ignore an identifier field if it does not match any entity record in the system. The identifier field must be properly formatted in order to benefit from this parameter. The component will process the remaining fields in the input record as if the identifier field was not included. If this parameter is set to False, an identifier field that does not match any entity record in the system will cause the whole record to fail with an error. The default value is False. Example: If the Primary Contact is being updated in an Account record and the Identifier for the Primary Contact is wrong, the rest of the Account record will still be updated if this parameter is set to True. This is shown in the demo video. This parameter is only here for backward compatibility with implementations prior to version 1.6. For implementations before version 1.6, set this to True if you want to be able to determine which of your input records are new and which already exist. For implementations using version 1.6 or later, use the Upsert Action instead. The default value is False. Specify the number of rows to be sent as a batch. When set to 1, the component will use the regular single request API. When set to greater than 1, the component will use the new CRM 2011 bulk multi-requests API. CRM 3 and 4 systems will ignore this setting and always use single request API. Specify how to handle multiple matches when using Upsert action. This parameter has the options listed in the following table. UpdateFirst Update only first match (default). Specify to avoid sending fields where input data matches existing data. This parameter has the options listed in the following table. True The existing data is loaded and compared to input data. If input data is same as existing data, it is not included for update. False All input data is included in update (default). Specifies how NULL values are handled. This parameter has the options listed in the following table. True The NULL values are ignored and not sent for processing. False The NULL values are sent for processing. Specify the method used to determine which records are new and which already exist. This parameter has the options listed in the following table. PrimaryKey Specifies to determine existing records by primary key. AlternateKeys Specifies to determine existing records using alternate keys. Selecting this option displays the dynamic parameter UpsertAlternateKeys. DuplicateDetectionRules Specifies to determine existing records using the system-defined duplicate detection rules. Duplicate Detection must be enabled in Dynamics CRM and rules must be published in order for this to work. Use the Duplicate Detection Rules in Dynamics CRM to indicate the field(s) to be used to match records. The entity record identifier (the GUID assigned by Dynamics CRM) may not be used as the identifier when using Upsert with this option for the UpsertMatch parameter. To use the GUID as the identifier for Upsert, choose the PrimaryKey option. Select the attributes you want to use as alternate keys for the Upsert action. Specify how to handle rows with errors. To see how to set this up, see the demo video. Contains the unique identifier of the added, updated or deleted record. To see how to set this up, see the demo video. Where can I find the documentation for the Dynamics CRM Destination? Creating or updating large number of records, sometimes result in error: "Unable to connect to the remote server"
Data flow transformation performing find-and-replace transformation in specified input columns using dictionary object. Each key from the dictionary is searched in the input column and if found replaced with the related value. 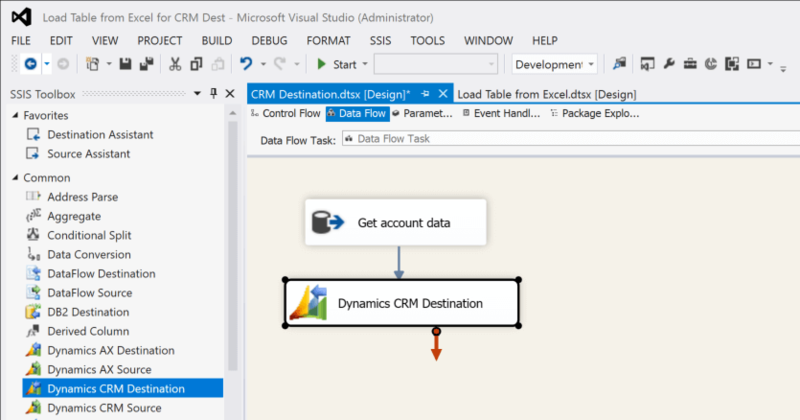 Data flow destination, creating Dynamics CRM associations between entities. Data flow destination, routing Dynamics CRM entity record to a queue. Data flow destination, establishing user access permissions to entities. Script task to perform Dynamics CRM bulk delete. Data flow destination executing Dynamics CRM workflows. Data flow destination to update incident entity state. Data flow destination to update opportunity entity state. Data flow destination to establish team members relationship. Data flow transformation to convert Dynamics CRM entity record from one type to another. Data flow destination to qualify a lead and create account, contact, and opportunity records that are linked to the originating lead record. Data flow transformation to convert a quote to a sales order. Data flow transformation to handle translation and creation (if needed) of Dynamics CRM OptionSet values. Fixed: Various fixes related to the IgnoreUnchanged option (Thank you, Mihkel). Fixed: Dialog opening generated error when using older SSIS packages (Thank you, Senthil). Fixed: Component assumed input date/time columns without time zone information are local time and converted them to UTC. This broke backwards compatibility for existing packages. Fixed: Component failed when trying to set salesorder entity as fulfilled (Thank you, Marvin). Fixed: Component failed to insert records in stringmap entity (Thank you, Kyle). Fixed: Component failed to set entity state in non-US localized target server (Thank you, Angelo). Fixed: Component failed to resolve incident entity when using Dynamics CRM 2011 web services (Thank you, Maurice). New: A new parameter UpsertMatch for Upsert action with three options: PrimaryKey, AlternateKeys and DuplicateDetectionRules. New: Support for the new Dynamics CRM 2015 UpsertRequest when using parameter UpsertMatch=AlternateKeys. New: A new parameter IgnoreNullValue. Fixed: Component was not detecting unchanged date/time input values properly when IgnoreUnchanged parameter was set to True (Thank you, Jessie). Fixed: Component failed to handle quote entity state attribute setup (Thank you, Jake). New: A new parameter MultipleMatch for use with Upsert action. The choices are: UpdateFirst, UpdateNone, UpdateAll, Fail. New: A new parameter IgnoreUnchanged to avoid updating entity attributes where the input values match the current values. Fixed: Component failed with error "String was not recognized as a valid Boolean" when trying to process boolean attributes input data set to 1 (Thank you, Srivenkata). Fixed: Component didn't include owneridtype attribute for update. New: Component now supports CRM 2011 bulk-load API. Fixed: Component failed with error "The maximum message size quota for incoming messages (2097152) has been exceeded. To increase the quota, use the MaxReceivedMessageSize property on the appropriate binding element." when processing large number of columns in CRM 2011 web services (Thank you, Dave). New: Support for Upsert action. New: A new parameter DetectDuplicate to enable duplicate detection rules during create or update. Fixed: Component was always reporting no error code (Thank you, Eric). New: Component now supports adding and removing records in CampaignActivityItem and CampaignItem entities. Fixed: Component failed to process input columns of type DT_NTEXT. New: Component now supports adding and removing records in ListMember entity. New: Component now supports update of more entity attributes. Fixed: Failed to create entity, when only one attribute was specified. New: Component now provides newly created records identifier. These public interfaces are used in Dynamics CRM components. They are provided for implementing advanced functionality in your scripts. In order for you to use these interfaces in your project, you have to reference CozyRoc.SSISPlus.dll and CozyRoc.Dynamics.dll libraries. Also include CozyRoc.Dynamics.Crm, CozyRoc.Dynamics.Crm.Service, CozyRoc.Dynamics.Crm.MetadataService, CozyRoc.Dynamics.Crm.DiscoveryService namespaces. When you call Dynamics CRM Connection Manager AcquireConnection method, it returns object implementing IConnection interface. This is the interface used for interaction with Dynamics CRM service. Connects to Dynamics CRM service. Closes the connection to Dynamics CRM service. Use always after you finish working with the service. service (int) - service type. It can be one of the options listed in the following table. CRM 4.0 - returns CrmService class from CozyRoc.Dynamics.Crm.Service namespace. CRM 3.0 - returns service class from CozyRoc.Dynamics.Crm3.Service namespace. CRM 2011 - Not available. CRM 4.0 - returns MetadataService class from CozyRoc.Dynamics.Crm.MetadataService namespace. CRM 3.0 - returns service class from CozyRoc.Dynamics.Crm3.MetadataService namespace. CRM 2011 - returns service class from CozyRoc.Dynamics.Crm2011.DiscoveryService namespace. CRM 4.0 - returns CrmDiscoveryService class from CozyRoc.Dynamics.Crm.DiscoveryService namespace. CRM 3.0 - Not available. privilege (int) - entity privilege. It can be one of the options listed in the following table. 0 Privilege unspecified. All entities will be returned. 1 Return entities, which permit record creation. 2 Return entities, which can be read. 3 Return entities, which can be updated. 4 Return entities, which permit record removal. 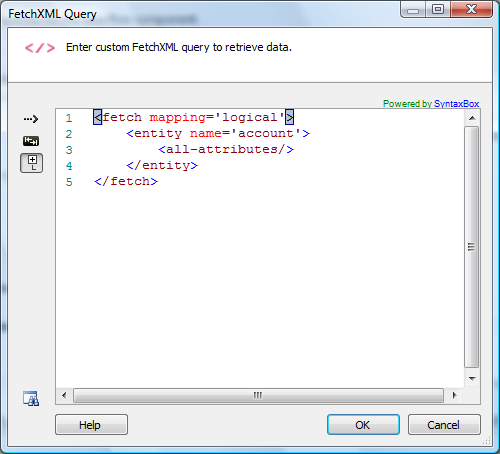 fetchXML (string) FetchXML query statement. DEPRECATED: Use IEntity.GetAttributes method instead. entity (string) - entity name. fetchXML (string) - FetchXML query statement. DEPRECATED: Use GetEntity method instead. name (string) - entity name. DEPRECATED: Use IEntity interface instead. entity (ICrmEntity) - object with create data. ignoreMissingId - specify to ignore attributes referencing missing data. detectDuplicate - specify to enable duplicate detection rule. entity (ICrmEntity) - object with update data. entity (ICrmEntity) - object with delete data. Specify deployment type. This property has the options listed in the following table. 0 Connect to on-premise Dynamics CRM server. 1 Connect to Dynamics CRM Live service. 2 Connect to hosted Dynamics CRM. 3 Connect to Dynamics CRM 3.0 system. 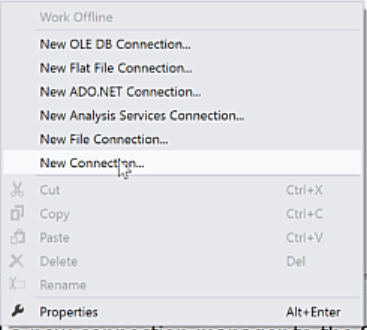 4 Connect to Dynamics CRM 2011 web services 1.6. Specify the name or IP address of the Dynamics CRM server. Specify user name to access the Dynamics CRM service. Specify user password to access the Dynamics CRM service. This interface is used to retrieve entity attributes information. Returns true if attribute can be read. Returns true if attribute can be specified for record creation. Returns true if attribute can be specified for record update. Returns true if attribute is primary key. Returns attribute entity reference if attribute is lookup. Returns attribute type. It can be one of the options listed in the following table. This interface is used to manipulate entity record. name (string) - attribute name. attributeType (int) - attribute type. For valid values check CrmType property in IAttribute interface. reference (string) - entity reference. Only used when dealing with lookup attributes. index (int) - attribute index. value (object) - attribute value. Returns the entity name this object is associated with. Get entity attributes. The method returns array of IAttribute objects. Constructs new Dynamics CRM entity data instance. entity (object) - entity instance. list (object array) - array of Dynamics CRM entities to create. list (object array) - array of Dynamics CRM entities with update data. list (object array) - array of Dynamics CRM entities with create and update data. list (object array) - array of Dynamics CRM entities to delete. This interface is used for reporting back status. Returns the Dynamics CRM entity identifier. Returns the Dynamics CRM error code. If zero, there is no error. Returns the Dynamics CRM status message. We started using COZYROC SSIS Tools back in 2011 when we were evaluating multiple CRM systems to replace our existing CRM system. COZYROC tools made it a breeze to move data back and forth between our SQL Server databases and Microsoft Dynamics CRM as well as Salesforce. COZYROC enabled us to rapidly transfer data among various systems for our CRM evaluation without having to write custom code to load and read data. COZYROC SSIS Tools made it easy for us to get Salesforce rolled out to new teams over the years because we were able to effortlessly transfer data from other CRM systems, MS Excel, and csv files to Salesforce. MetaBank finds that COZYROC’s tools provide easily configurable tools that allow us to perform more complex operations without additional coding. We have been able to implement these components across the entire team to allow for consistent use. The components provide flexibility beyond that of the stock components provided by Microsoft that work more intuitively than Microsoft tools. Because of the flexibility and intuitiveness of the components, paired with the fact that the components are used consistently across the team it speeds up development time for our ETL solutions. Meta utilizes COZYROC for the following SSIS integration task. Excel Task, Send Mail Task Plus, Excel Destination Plus, Excel Source Plus, Lookup Plus, Dynamics CRM Destination, and Dynamics CRM Source. The product is user friendly, intuitive, and just works well. Even more importantly, if we have questions of any kind, we always receive a very prompt and knowledgeable response for support. Our company, Altai Systems focuses on non-profit membership organizations. Each project presents extreme data migration and transformation issues. Using a SSIS based tool like COZYROC has make our lives a lot easier. John KlemetsrudSenior CRM Business Consultant and Guru for Altai Systems, Inc.